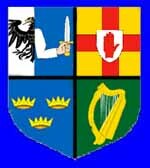 Irish Rugby.net - links, fixtures and clubs of Irish Rugby. Welcome to Irish Rugby.net, a guide to Rugby in Ireland. 20th March - A disappointing day against Scotland in Croke Park. For details of all the 6 nations fixtures click here. Ulster's hopes of securing a semi-final play-off spot in the Pro12 suffer a potentially fatal blow with a home defeat by Leinster. Connacht deal a major blow to Ulster's hopes of making the Pro12 play-offs by deservedly winning Saturday's clash in Galway. Leinster score eight tries against Edinburgh at the RDS to secure a home semi-final in the RaboDirect Pro12. Ian Keatley kicks 20 points as Munster hold off their fellow play-off hopefuls Glasgow in the Pro12 encounter at Musgrave Park. John Afoa is given a four-week ban which rules him out of Ulster's Heineken Cup semi-final with Edinburgh. Willie Faloon believes there are still places up for grabs in the Ulster squad for the Heineken Cup semi-final. Munster coach Tony McGahan thinks Ulster have a great chance of being crowned Heineken Cup champions this season. The club is looking for new players and welcomes participants from beginners to the more experienced pros. Training starts at 7.30pm on Tuesdays and Thursday nights, with games on regularly from September onwards. The first training session of the season starts on the first Tuesday of August. If your rugby club is not here, send us an email and we'll include it.